Ahead of the cutting season, our 2019 lineup of walk power mowers is arriving. Honda and Toro continue to lead the industry in quality, innovation and value. For decades, these brands have set incredibly high standards. While many other companies have vanished from the marketplace or devalued their label, Honda and Toro continue to innovate and grow. We are very excited about some improvements and new innovations. For 2019, Toro introduces the 22″ Toro Recycler SMARTSTOW with Personal Pace (20340). Toro has taken the most popular features from other models: SmartStow, Personal Pace and 11″ high rear drive wheels. These features should make this one of best selling models for the season. 11″ high rear drive wheels with rugged tire treads handle uneven terrain. The mower is driven by Toro’s Personal Pace rear wheel drive transmission and SmartStow allows the mower to be stored in an upright position. After testing the mower in our showroom, we are pretty excited to see this mower in action. There are two levels of quality in walk powered mowers. The simplest way to distinguish quality mowers from premium is deck material. The majority of mowers in the market feature steel decks. The Honda HRR2110VKA is our featured mower in this class. We love this mower and Honda has updated the 2019 model with a new deck and wheel design. The Honda HRR216 Series provides an exceptional value without sacrificing engine and cut quality. Honda’s legendary engine combines with twin blades, an updated deck design and more aggressive wheel tread to maintain any lawn. At $399, the HRR216 offers a durable variable speed transmission; 3 in 1 (mulch, bag and discharge) deck, reliable Honda GCV160 engine and a precise Twin Blade MicroCut System. So for the third year in a row, the best value in the steel deck class is the Honda HRR216. The second level of quality is distinguished by thicker decks (aluminum in the case of Toro and Nexite in the case of Honda). These decks are cast for strength, enhanced cut quality and provide outstanding durability. The engines, transmission and hardware on premium mowers are more robust and reliable than lower cost models. Premium mowers not only perform better than steel deck models, Toro and Honda back these premium models with a 5 year limited warranty. 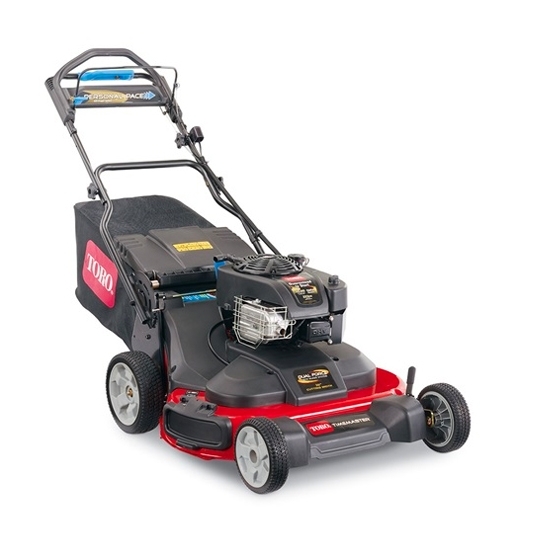 When customers demand a premium lawnmower, our choice for value is the Toro Super Recycler with Personal Pace (21381). Toro’s Personal Pace® self propel Super Recycler is one of our best selling lawn mowers. It features a Toro TXP 159cc OHV w/Auto Choke engine, Quick Stow Storage Handle for compact, easy storage and the most enviable self propel system in the market. The Personal Pace system is completely intuitive–matching your walking speed precisely. Whether striding over wide turf or carefully maneuvering around landscaping, this mower is ideal. For added convenience consider the ease of blade override system: 21″ Toro Super Recycler with Personal Pace & Spin Stop (20383) or electric start 21″ Toro Super Recycler with Personal Pace & Electric Start (20384). 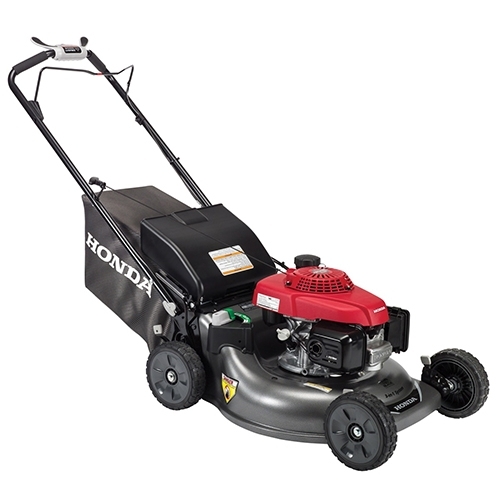 Honda has upgraded the best premium cutting lawnmower again for 2019. In the Premium mower class, Honda mower are distinguished by a larger engine and an innovative cutting system. For customers seeking a premium cut, the HRX-Series is a great selection. Honda’s Premium Residential Mowers feature 4-in-1 Versamow System™ with Clip Director® – mulch, bag, discharge, and leaf shred. This system allows you to direct the amount of grass clippings flowing into the bag. There is no need for side discharge chutes and mulch plugs. The versamow system reduces grass clippings without constantly dumping the rear bag. MicroCut® Twin Blades, highly engineered NeXite® deck, and the Easy starting Honda GCV190 engine all increase the cut quality from other models. Our selection for those focused on mulching is the HRX2176VKA. For the homeowner who wants best quality and ease of use, the Honda HRX2176HYA delivers. Since its introduction, this model has been decorated with awards, pursued by competitors and the class of our showroom. Perhaps the best way to explain why we love this model, once someone owns an HRX217HYA, they never consider a different model. In my opinion, that is the definition of quality. The HRX2176HYA adds a Roto-Stop blade clutch and Honda’s premiere hydrostatic transmission. The Roto-Stop blade clutch allows the operator to pause the blades without turning off the engine. You can safely remove the grass bag, open gates or clear yard debris without restarting the engine. The hydrostatic transmission allows the operator to dial in the exact speed and the mower maintains the pace (like cruise control in a car). The result is an extremely reliable, simple to operate lawnmower. The Toro TimeMaster is updated with improved cut quality, updated engine and more powerful transmission. While many manufacturers have attempted and failed to create a quality walk power mower with a side cutting deck, Toro has excelled. The 30″ cutting deck appears heavy, but Toro’s Personal Pace self-propel system moves the mower with ease. 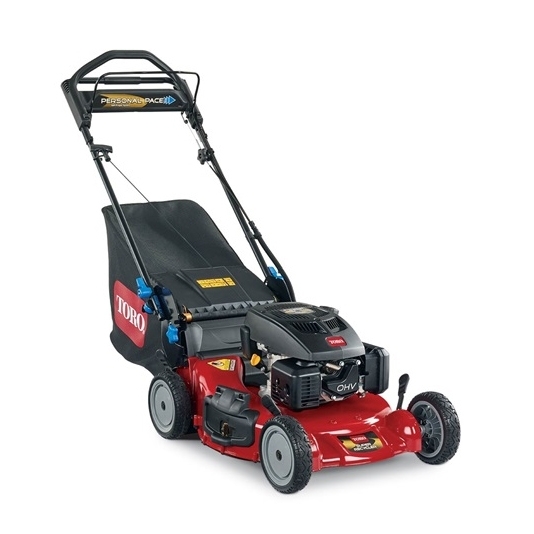 The 2019 model reduces mowing time by 40% without straining your budget. Homeowners love this model for its time savings and cut quality. We love the TimeMaster for its innovation and continued durability.